Asia will play a more dominant role in driving LNG demand. Long-term demand growth in Europe will be challenged by competition from renewables and batteries. London, New York and Singapore, September 12, 2018 – Imports of liquefied natural gas (LNG) will set a new record this year on the back of a robust 8.5% growth, according to new research published today. The rate of growth will slow from 2019 and further in 2020, before picking up again in 2021. Imports will expand at a steady rate during 2021-2027, before accelerating again. In 2030, total demand will reach 450MMtpa (million metric tons per annum). 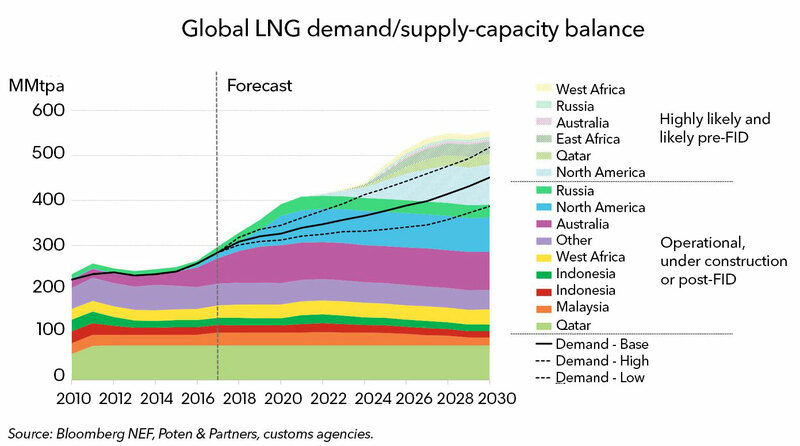 Global LNG Outlook 2018, the latest forecast from Bloomberg NEF (BNEF), shows that LNG demand will be 308MMtpa this year, up from 284MMtpa in 2017. Half of the 24MMtpa of growth will come from China and the remainder largely from Japan, South Korea and India. The report highlights that Asia will be the core growth region in the coming decade. “The region will add a total of 143MMtpa in 2017-30, accounting for 86% of the world’s total LNG demand growth in the period.” commented Maggie Kuang, head of Asia Pacific LNG analysis and lead author of the report. 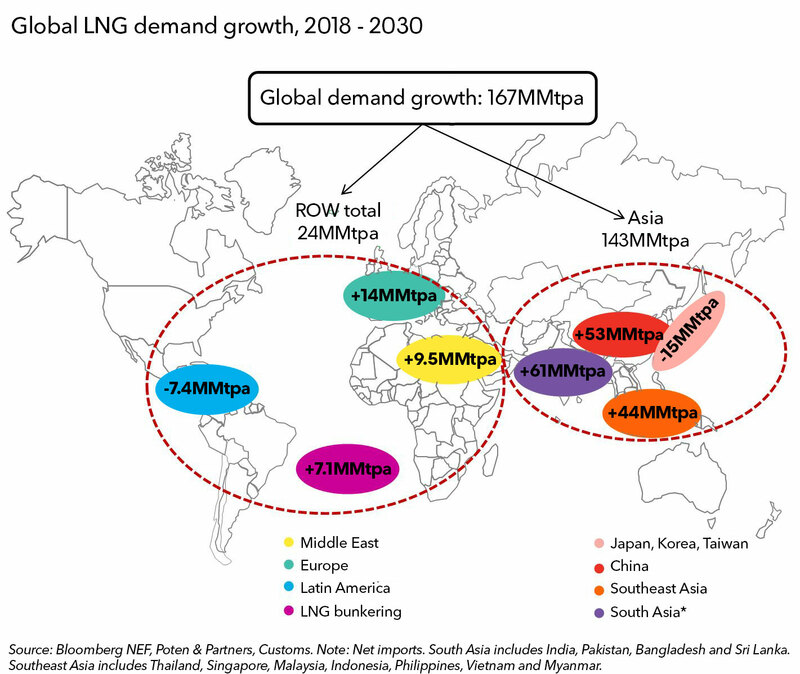 BNEF expects strong demand from China and emerging markets in South Asia to boost global LNG trade in 2019, with 12MMtpa likely to be added. This demand growth will slow down during 2020-21, when Japan restarts its ninth nuclear plant and Russian pipeline gas starts to supply China. On the supply side, 104MMtpa of new capacity will be added globally during 2018-21. Global post-FID (final investment decision) capacity is expected to peak at 392MMtpa in 2021, providing sufficient supply to meet demand to 2025. About 17 projects will likely take FID in coming years, potentially adding 172MMtpa of capacity by 2030. The growth of demand in Asia and a further drive to cut the cost of U.S. LNG will likely lead to some new sales and purchase agreements for U.S. LNG. “About 90MMtpa of ‘likely’ FIDs in the next few years are from North America, mostly in the Gulf of Mexico” said Anastacia Dialynas, lead LNG analyst, Americas. Volumes of new LNG term contracts signed each year since 2015 have been stagnating. In the first eight months of 2018, some 7.1MMtpa of supply contracts were signed, the same as a year earlier. The share of short-term (1-4 years) contracts went up to 41%, up from less than a quarter over the last decade. This indicates buyers’ increasing preference for shorter tenure. BNEF expects contract signing activities to revive from 2021 when existing contracted supply becomes thin. New contracts to underpin FIDs on new supply projects will also need to take place by 2021 to provide sufficient supply capacity post-2025.